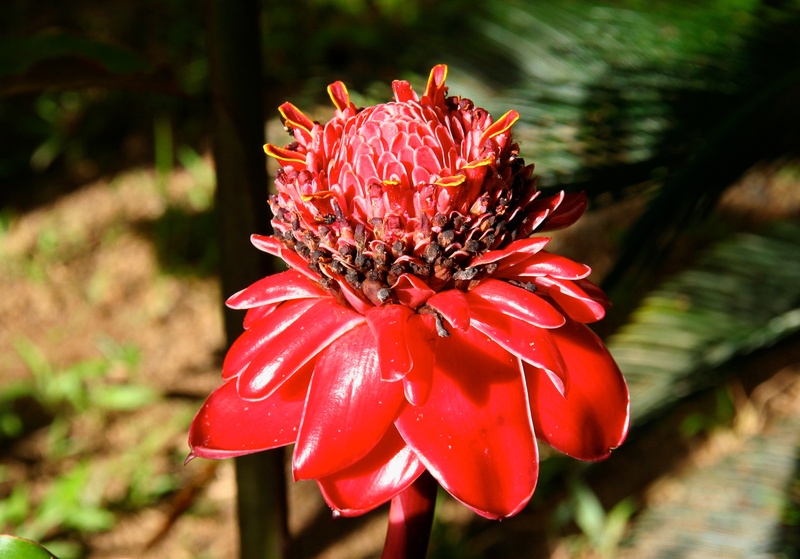 No clue what type of tropical flower this is, but it was shiny and red and attracted butterflies. And ants. 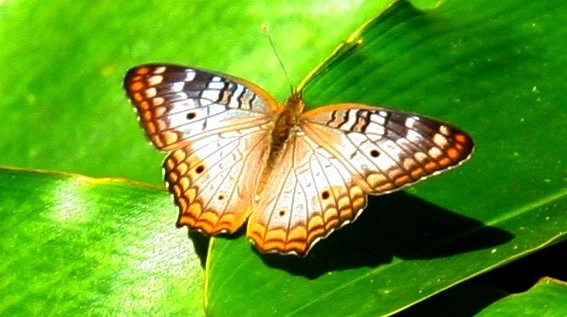 Itty-bitty butterflies like this one. 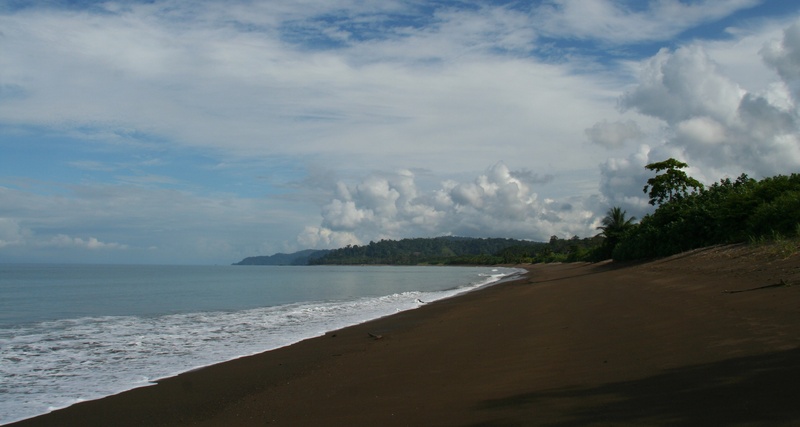 The beach at Pirate Cove stretches north past the Rio Drake 2 km. This is the view facing south, toward the resort. Notice that my footprints are the only ones there. 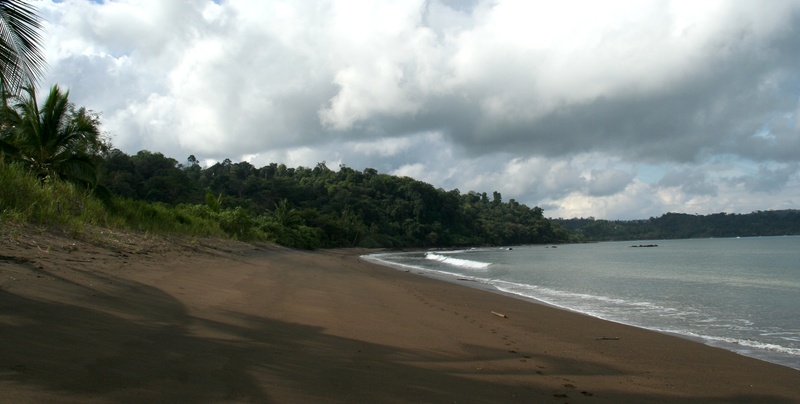 When they say this is a deserted beach, they’re not kidding! And this is the view facing north. Now, to say that this area is “natural” is an understatement. Apart form the volcanic rock formations that dot the shore directly in front of Pirate Cove, there are also teeny jelly fish in the water. None that I could see, but I could feel them stinging my legs when I was swimming. Like I said, the beaches here aren’t lounge-worthy, but that’s not why people come to Bahìa Drake anyway. Annnd, while I was in the water, I saw a pair of scarlet macaws fly into the almond tree in front of me! (You’ll always find them in pairs, BTW, and in almond trees.) Slowpoke me, I couldn’t get out of the water fast enough to snap pics of these gorgeous creatures. Grrr. ‘Cause as soon as I grabbed my camera, the scarlet macaws flew away. But you can still see how spectacularly colourful they are! Simply stunning. 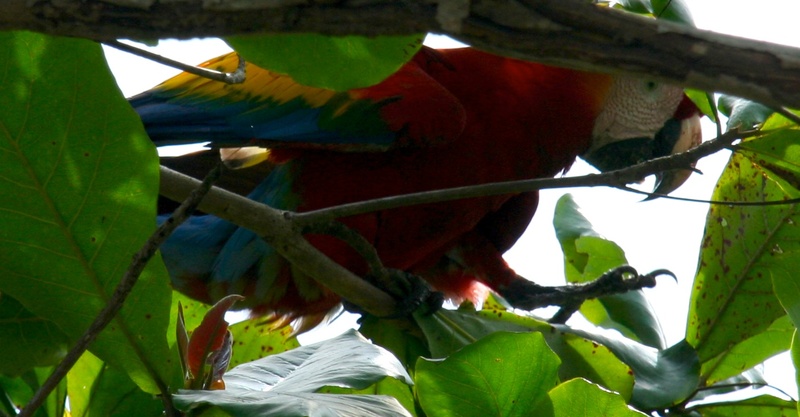 What to do after the high of seeing my first scarlet macaws? Why, poke around the river, of course! Rather easy when the beach backed onto it in spots. 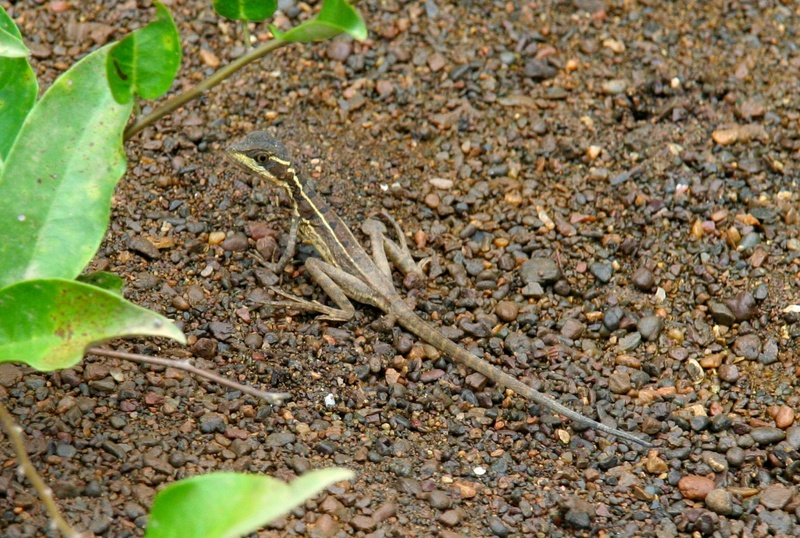 Not that I enjoy reptiles – ’cause I don’t – but I spent a fair bit of time chasing this lizard every which way as it scurried about and then froze whenever I came near. Not as thrilling as seeing red-eye tree frogs in the mangroves, but still fun. Always fun! 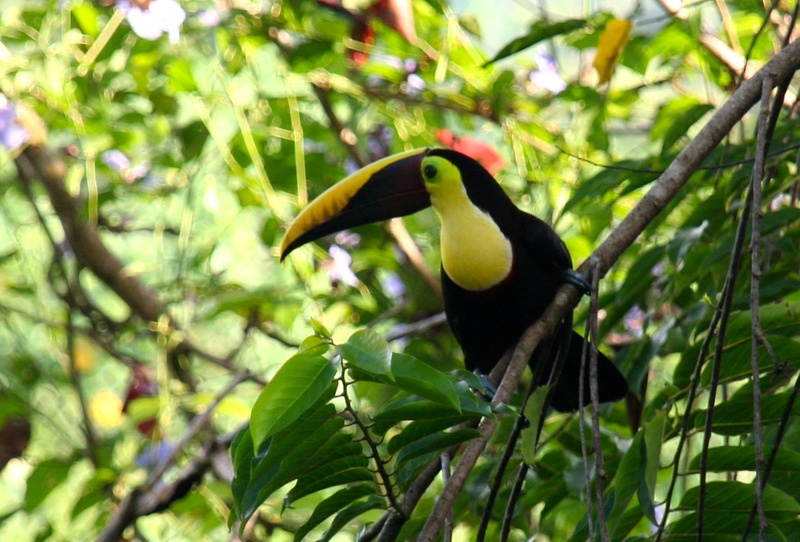 So apparently, Costa Rica is birdwatching heaven. Snooze. No, no, I’m just kidding. 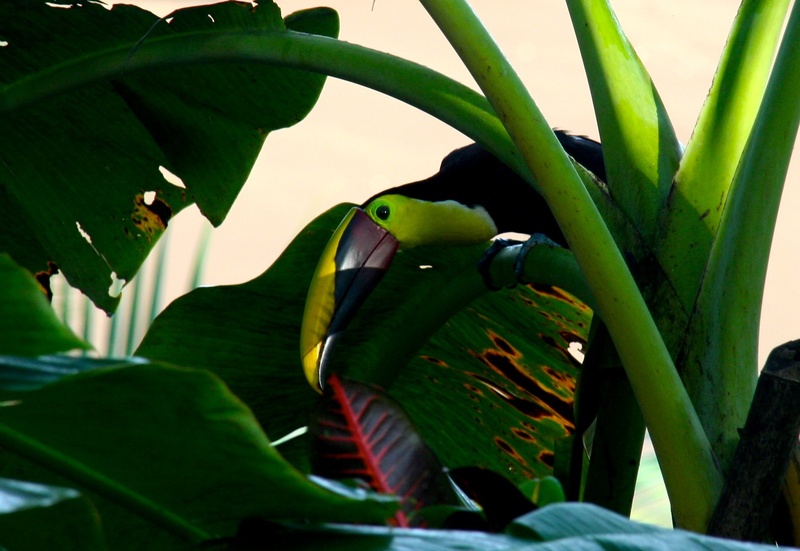 In fact, I went on a birdwatching tour just before I left Bahìa Drake, though, really, nothing could compare to seeing the toucan and scarlet macaws right outside my bungalow! 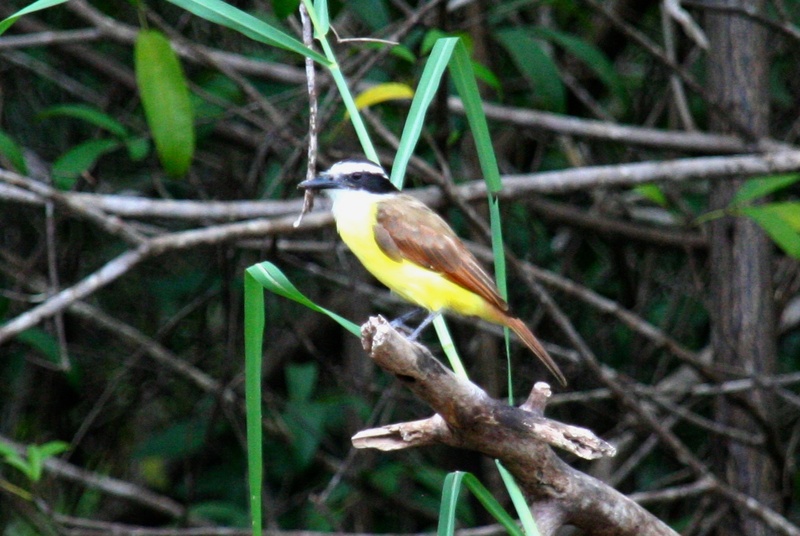 This social flycatcher was a fairly common sighting by the river and the resort. Hm, well, lookie here. Going through my pictures makes me realize I saw waaay more on my lazy day than I thought. 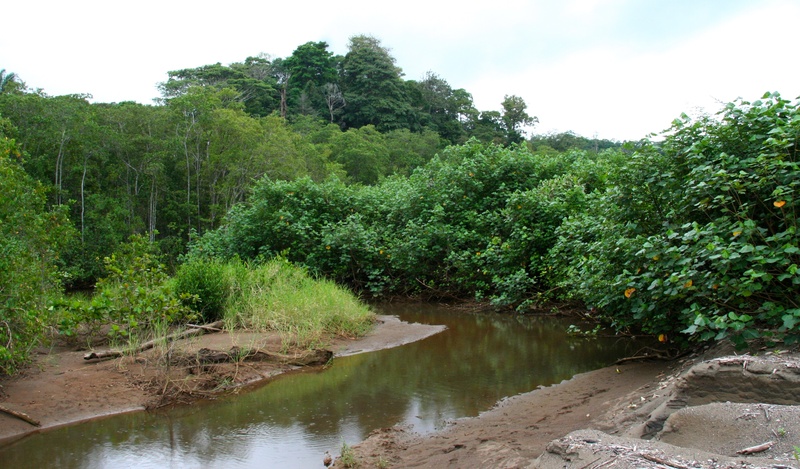 A toucan, scarlet macaws, lizards…you’d think I was in a jungle! ;) And all that was before lunch. Lunch and the adventure that followed will follow indeed, in a separate post, natch. And you can read about it…here! GO!